Creating a strong folder structure is the best way to start organizing your digital pictures. Such a structure can be expanded with the use of tags if needed (see Tags vs. Folders). I also believe that folder names should follow a certain naming convention that should be followed consistently. In this short article, I will outline the folder naming convention I use. How do we remember events? Have you ever wondered how you remember events? If someone asks you if you remember being at a certain event, what do you need in order to remember it? Do you need to know what season it was, spring or fall? Or how about the time of day: day or night? While these things may help, most of us would most likely need three pieces of information in order to remember a certain event. A description of the event. (usually a short description would suffice). 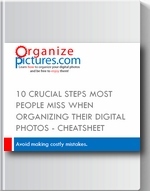 This is a very simple observation but it turns out to be very powerful when it comes to organizing your pictures. Most people take pictures at certain events (professional photographers are an exception to this rule) and it is this events that they would have to remember in order to locate the pictures they have taken. Therefore naming your pictures folders such that the name includes these three pieces of information will help you remember the event you’re looking for, and therefore you should be able to locate the pictures you want to find. Inserting specific pieces of information in your folder names means that you are actually “tagging” your folders instead of your individual pictures. use some sort of delimiter between the date fields (underscore or dash). The most important thing about naming conventions is to stick to them. I mean that if you agree to name your folders with this structure you always have to do it the same way, otherwise the system will not work. This means that you always put the date first, the place second and the description third. Out of all three, the date is the most important and it should always come first so that your operating system will automatically sort your folders according to the date…which is really nice! Will we see this site for sale? Do you also develop websites or do SEO work? Jody…not sure what a Domainer is, but my site is not for sale. I do know how to develop websites but that’s not my main job. Why not simply date with having no delimiter? I have been using 20170530 for nearly all files. Will there become an issue of which I have not considered? Have you considered creating a method of auto-naming files? All files are TODAYS date using this format? A script? I am not techy. You think there is another purpose for Matt to use brackets? I cannot think of one other than the one he states: appearance. Do you still feel Picasa supersedes Google Photos? I feel that face recognition is a bit scary. All those faces out in the cloud. I suppose the CIA is tickled. We need a method of detecting which graphic shots (jpg png etc) are NOT photos, but documents. Then create a workflow to convert them to, say pdf, having some OCRd and auto-named date, and title of the document. These should be designated to a particular folder (s) such that they ARE NOT in a cloud. AND the data volume becomes sooooo large that scanners, dup-finders, and sorters become bogged and hang. Nice that you are techy and artsy!!! Jody…good question! Well there is nothing wrong for not using a delimiter in file and folder names other than it is a lot simpler visually to have the year, month and day separated. Picasa and Google Photos serve two different purposes. Google Photos doesn’t allow you to control any physical files…there is no control on the storage of files. It is meant for sharing photos. This is what I use it for…for sharing and displaying selected photos on my tv. Picasa works with your local folders and allows you to control the physical storage of your photos. I use mainly Lightroom for photo management but also Picasa sometimes for searching photos. What I would like to learn from you is why you decided not to use any spacing in your titles. Is that for some compatibility reasons? I find the bla-bla-bla-bla format a bit unnatural, harder to read. Matt…i am a computer programmer and in general i do not like spaces in file names. This way the file names work on any operating system. Being a novice at this, it is difficult for me to comment until I get my feet on the ground. Tal…no problem. When you try organizing your pictures you will get pretty good at it. Please let me know if you have questions.